Back in my college days I read William Shirer’s The Rise and Fall of the Third Reich for a class entitled “The History of Germany and Central Europe.” Shirer, as an on-the-spot reporter in Berlin for a major American radio network between 1934 and 1940, was an eye witness to the rise of Nazi Germany. If he had stuck to this time and its immediate aftermath, his book might have been superb history. Instead, Shirer (who is no historian), parroting the accusations of some earlier critics, reached back in history to make a direct link connecting Martin Luther to Adolf Hitler. Luther is blamed for instilling blind obedience to authority as well as anti-Semitism. 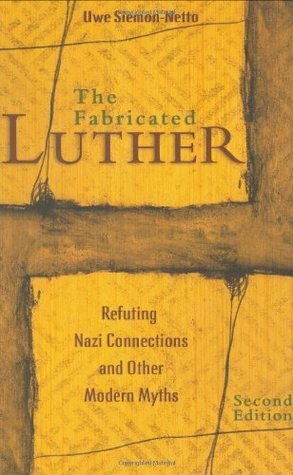 Uwe Siemon-Netto’s title, The Fabricated Luther: The Rise and Fall of the Shirer Myth, is perhaps a little misleading. It is not entirely about Luther or Shirer’s book. Much attention is given to those Lutherans who made up the German resistance to Hitler as well as the role Lutherans played in ending Communism in East Germany. Soren Kierkegaard, the philosopher and theologian, abhorred the “paragraph vultures.” They are described in the Editor’s Foreword as pouncing "on isolated ideas of an author out of context, thereby distorting the author’s fundamental line of thought.” Siemon-Netto writes, “To sum up, elements of an immensely complex theology were ripped out of context to forge a stereotype that is haunting Lutheranism to this day.” If Nazi totalitarianism inevitably emerged from Luther’s teachings, why did this phenomenon not appear in other Lutheran nations such as Denmark and Norway? Some of Luther’s intemperate remarks can be explained in terms of the hyperbolic language of 16th century Saxony. “Saxons practice the art of overstatement. They like to ‘let rip,’ assuming that their colorful remarks will be taken with a grain of salt by their audience.” An example of such hyperbole is Luther’s “sin boldly” remark made in a private letter to Melanchthon addressing the question of whether there is any sin that is so great that God cannot forgive. The rest of the sentence is often omitted. “Sin boldly, but let your trust in God be stronger.” Only when ripped out of context does Luther seemingly give permission to sin. An enlightening account of the connection between Protestantism and politics. This book is highly detailed and informative, following Lutheran thought through 500 years of German history. Having already studied Muntzer, who in Luther’s time stirred up war in order to implement his vision of a more perfect society, I was fascinated by this account of Adolph Hitler as Muntzer’s spiritual successor. Luther, who for his part encouraged nonviolent interactions and civil disobedience in the face of extreme suppression and injustice, is here compared to such activists as Dietrich Bonhoeffer and Martin Luther King, Jr.Moreover, I enjoy reading about history, and I was glad to read accounts of the Nazi regime, the anti-Nazi resistance, and the fall of Communist East Germany—all viewed through the lens of Lutheranism. Looking at how different churches, ministers, and congregations either supported or opposed Hitler certainly opened my eyes to a nuanced social, political, and religious movement. Finally, I have long been interested in the history of the Second World War, but I have never studied it from a German point of view, nor ever encountered such a detailed and nuanced portrait of the complexities of WWII German politics. While much of what I had previously read paints all of 1930’s & 1940’s Germany with the same wide brush, this account describes the German resistance—the German citizens who tried to depose Hitler, who sought aid from Allied forces, and who risked and sometimes lost their lives in the attempts. We all know stories of American and British heroes who moved against Hitler. It was nice to learn of the resistance from within Germany as well. Uwe Siemon-Netto - Uwe Siemon-Netto (born October 25, 1936), the former religion editor of United Press International, is an international columnist and a Lutheran lay (non-ordained) theologian. He is the founder and emeritus director of the Center for Lutheran Theology and Public Life (CLTPL) and League of Faithful Masks, a non-profit religious corporation based in Capistrano Beach, California. CLTPL/LFM champions the Lutheran doctrine of vocation as an antidote against the destructive force of contemporary narcissism.This doctrine holds that Christians have a divine calling to serve their neighbor in all their secular endeavors. CLTPL was formerly located at Concordia Seminary St. Louis, Mo where Siemon-Netto served as scholar-in-residence until 2009. As a journalist, Siemon-Netto specializes in issues relating to faith and society, and in foreign affairs. He is a correspondent of freepressers, an internet publication, and was a contributor of The Atlantic Times, an English-language monthly newspaper produced by leading German journalists for the North American market; he also taught as a visiting professor of journalism at Concordia University Irvine.